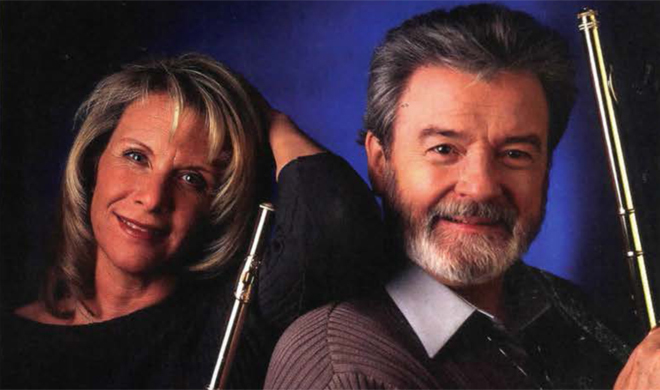 Flutist Sir James Galway is internationally regarded as both a matchless interpreter of classical music and a consummate entertainer whose charismatic appeal crosses all musical boundaries. During his 50-year career, the Belfast-born Galway has sold more than 30 million albums and recorded more than 60. Starting February 22, Sir James will embark on a 22-U.S.-city tour with the Polish Chamber Orchestra as soloist and conductor with his wife Lady Jeanne Galway, also a flutist. Patricia Harty caught up with Sir James by phone from his home in Lucerne, Switzerland just before Christmas. Are you a flutist or a flautist? Flutist. I don’t play a flaute. I play a flute! I just got back right today. I was on a tour of the U.K. I did three big Christmas concerts and three charity concerts — one of them was with Sir Cliff Richards, who is involved in an organization that teaches underprivileged kids and kids with Down Syndrome to play tennis. It was very touching. You’ve got to see the looks on these kids’ faces when they just manage to hit a ball. I also did a concert for cancer research and a concert for the Salvation Army. Do you feel you have an obligation to give back? I don’t feel I have an obligation but I just feel it’s something I want to do. On your upcoming American tour you will be conducting as well as playing. When did you decide to take up the baton? I’ve been conducting for 25 years. There is a picture of me in New York in 1980 conducting a Mostly Mozart concert. The reason I got into conducting is because I get hired by a lot of conductors who use me to fill the hall, and what happens is that on the day of the performance, I would get 20 minutes to rehearse my piece that takes 20 minutes to play. Meanwhile, they’re rehearsing for six hours the day before — the Beethoven symphony or whatever it is — because they want to make sure it’s a big success. So I got fed up with this. You see, it is a question of getting the thing right. I know the speed I’m comfortable playing at, and when it’s over I don’t want to have to tell the conductor, `Well, it was nice,’ when I know darn well it was not okay. So, I’m a conductor not because I want to conduct pieces. Although there are orchestras who ask me to do symphony concerts and I do them. I just conducted in Norway. I’m a conductor who conducts because I want to do my own thing. This wanting to do your own thing — it seems that you are up for anything musically? You don’t want to be taken in by that. What happened in the early days is that RCA saw what a runaway hit me playing crossover was. [Galway’s version of “Annie Song” written by John Denver sold millions.] So we made a deal; four crossovers and three classical and we kept doing that. So when you look at my output it does look like it’s a bit pop and crossover orientated. But in fact, in my recordings are some of the best flute concertos of all times. Last season I only played two crossover concerts, and they were with the Cincinnati Pops, otherwise I just play and conduct classical music. Who would you say is your favorite composer? That’s very difficult to say, very difficult indeed. It’s like asking an actor `who’s your favorite playwright?’ You’ve got to say Shakespeare. And you’ve got to say Mozart, Beethoven, Schuman, Schubert, Hayden, Vivaldi, Bach, all these guys. I mean they all wrote tremendous music. Have you ever played anything by Northern Ireland composer Hamilton Harty? No. I do know the flute solo he wrote but I haven’t played it in public. We haven’t had many great Irish classical composers. Well, there’s Charles Viller Stanford, born in Dublin, son of a Protestant lawyer, and he became very famous in his time. I actually conducted one of his symphonies, twice in America, once with the Columbia Symphony and once with the Washington Symphony. So, what’s the best thing about being famous? I don’t know if you are any better off being famous. Today when I was checking in at the airport, because I had eight bags to check in, the guy behind me was giving me grief and said I should step aside so he could check his four. How many flutes did you have in your bags? Only two. But because we were on tour, and it’s Christmas and all the kids give you teddy bears, and someone gives you a book of famous quotations, and another one gives you a book on the streets of Cork — these are all gifts from people and I’m not going to throw them away. I’m taking them home and I’m going to enjoy reading these books and I’m going to enjoy this teddy bear that this little girl gave me in Wales. Because you look around your room and you see all these things and it brings back memories of what you’ve done. As a Christmas present last year you commissioned a new piece of music by Lowell Libermann for your wife. What did you get her this year? I bought her a nice necklace from Cartier with earrings to go with it. Don’t even mention the price. Does it seem unreal to you sometimes — the contrast of growing up poor in Belfast with an outside toilet, and the fact that you can now shop at Cartier? It does. I sometimes sit here and think that if my parents were alive and were to walk into my house, they would think I was babysitting the house. Were you aware that you were poor growing up? No. When you are poor you are not aware of it, but things actually matter when you are poor. It matters if you have a pair of shoes with holes in them or a pair of shoes with less holes in them. When I was a kid I was like a model for Angela’s Ashes. We were so dirty you couldn’t believe it. If we walked into a church they would think we were there to steal the Bible. Have you been back to Belfast lately? Oh yes, I played two concerts there, one with the Belfast Youth Orchestra to celebrate its 50 years, and 25 years of the Belfast School of Music, which was a big, big success. We had about 350 kids on stage singing and 100 kids playing the flute! It was great, completely sold out. And two nights later I did a concert for the Salvation Army. I am good friends with the Salvation Army because they do an incredible amount to help the poor. Phil Coulter [singer/composer from Derry] told me that there were several people on his street growing up who wouldn’t have made it if it wasn’t for the Salvation Army. What’s it like living with another flute player? No. We have a rather large house, so when Jeanne is practicing in the house I can’t even hear her. We do play together from time to time for fun. We play duets. We’ve been married for 21 years, and we’ve been at it for 23 years. We met in New York when I was giving a master class. Jeanne is American-born. She loves Ireland. She thinks Belfast’s great. I showed her where I used to play football, and took her to meet Mrs. Beggs, a neighbor who is now a hundred years old and she remembered me like it was yesterday. Working with students. I’m developing a new website, The Galway Network (www.thegalwaynetwork.com) for serious students and teachers that will include my interviews with soloists, flute exercises and demonstrations. It’s an extension of my organization Flutewise, which is a volunteer-based non-profit organization, which encourages young flute players. Do you ever have stage jitters? Never. I say to kids, you have to be able to jump out of bed, pick up your flute and play that thing dead. There’s no working up to it. Know your instrument. Know your music. So, it takes more than talent? Yes. You actually have to practice and do a hell of a lot of hard work because the standard is very high and you really need to be very well equipped to enter this profession. And it’s not just a question of talent or how much you practice; it’s a whole lot of things together — endurance, physical strength, concentration.